I’m perusing a large backlog of emails, a byproduct of being on the road for the past three weeks. There’s a line item in a message from the Los Padres Forest Association mentioning the Island View Trail. A click on a link brings me to the race webpage. The course for the Island View Trail Race follows the path of the Franklin Trail (see link for race map: Franklin Trail/Island Race Map), a project the Santa Barbara Trails Council has been working on for several years. 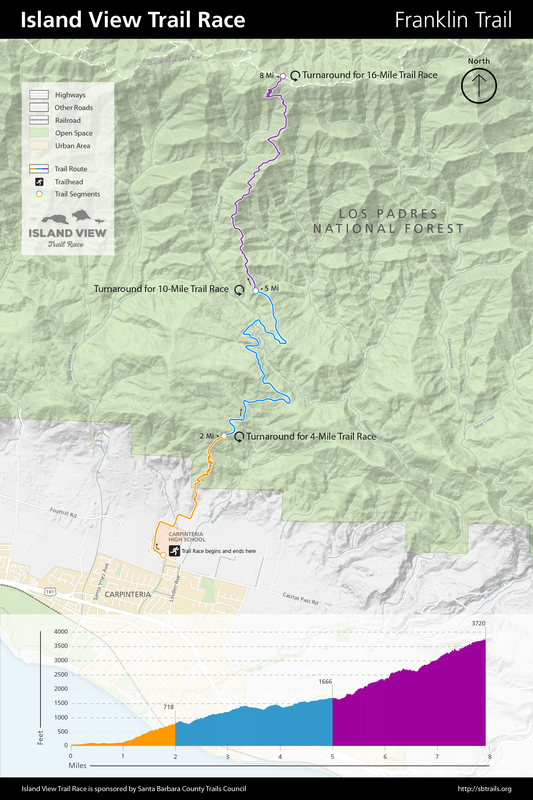 The Franklin Trail starts just to the west of Carpinteria High School and rises 3700 feet in 8 miles where it connects to other backcountry trails. The proceeds from the race will be used to put the finishing touches on the trail. The event was a trifecta. This is a trail I’ve wanted to explore for a while now, the race proceeds would go to support the trail, and it was a chance to get back into trail running. (Alastair Humphreys had recently posted a video on hill running (see link: Why I Run) and I was inspired to give it a go once more.) There were three distance options: 16 miles, 10 miles, and 4 miles. Surely I could do 4 miles, maybe even 10. Time to sign up. My finger was poised above the ‘register’ button, then I paused. Time for a reality check. The race was just two weeks away. My last trail run was more than a decade ago. I couldn’t remember when I ran even a mile on flat ground, much less four trail miles with 600 feet of elevation gain. Then there was the plantar fasciitis I had been battling for over a year. Might be a good idea to visit the local hill for a training session before signing up. Eleven days before a race is probably not the best time to start training. Having said that, it’s still better than showing up at the starting line without any practice whatsoever. As my feet pounded the pavement I remembered why I gave up road running. There were several reasons, but foremost was jogging on the sidewalk or on the street was boring compared to running up and down a trail. Road running on even pavement felt monotonous compared to the dynamic, almost dance like, movement required to chart a course through the roots and rocks found on backcountry paths. This might not be as much fun as I thought. The practice run (it was more like a jog/power walk) squashed any lingering hope of doing the 10 mile course. 4 miles would be a suitable reintroduction to the sport. I dialed back my goals to: No crying, no crawling, no cr@pping, and finishing in under an hour. Back at the computer, I signed up. “Finishing is not important, starting is what’s important.” Maria Schur’s words from our Sprocket Podcast appearance last month echoed in my head and provided gentle reassurance. I wasn’t in the best of condition for running (though I had been hiking a lot over the summer) and hadn’t properly trained, but that wouldn’t prevent me from starting. This was going to be an adventure, and hopefully, ‘Type 2’ fun as well. There are fifty other people awaiting the start of the race, but I’m in my own little world, inwardly focused, excited to start. Still I’m glad for the company, for the camaraderie among the runners. Most of the people participating in the 4 mile run are here for fun. I’m also grateful my wife is here to cheer me on. We’re off. The race begins with me near the back of the pack, the course makes a loop around the parking lot and then we move from asphalt to dirt. It’s a cool, overcast morning, for which everyone is grateful since there’s little shade on the Franklin Trail. The first mile is a gentle uphill, nothing too steep, and the group starts to spread out. Mile two is the hardest mile of the race with switchbacks and 500 feet of gain. I switch from running to power walking. Depending on the steepness of the trail, walking can be faster and more efficient than running. (See link: A Trail Runner’s Guide to Uphill Running) In my case it’s academic, a fast walk is all I’m capable of doing on this section of trail. I reach the turnaround point and start back down, running once again. I pass a course photographer, smile and proclaim: “gravity is your friend!” There’s a woman ahead of me and I stay about 10 yards behind her for much of the steep downhill. After a while Ginger slows a bit to let me pass and asks me to be the pacer for the rest of the way. She’s earned it. 50 yards before the finish line I pull aside to let her pass and she finishes three seconds ahead of me. My time: 45:22. I’m tired and happy. Goals were met, my time better than expected, the lower section of the Franklin Trail was scouted, and, most importantly, I had fun. No aches or pain either, always a plus. I’m already planning a longer trip, a hike this time, to explore the upper section of the trail. Springtime should be ideal. The take away: Don’t be afraid to challenge yourself. Most of us don’t realize what we’re actually capable of until we start doing it.